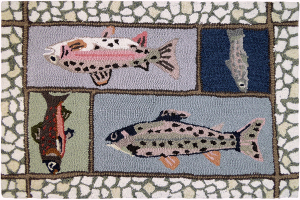 These colorful hand hooked trout designs by Cynthia Maccollum look great in cabin, lodge or home! Polyester hooked rug with cotton canvasbacking. Vacuum regularly. Spot clean with low sudsing detergent - rinse carefully with a solution of light vinegar and water whenever possible. Professionally clean when necessary. Carefully trim sprouts with scissors. Do not pull loose yarn. © Copyright 2019 The Rogue Angler.